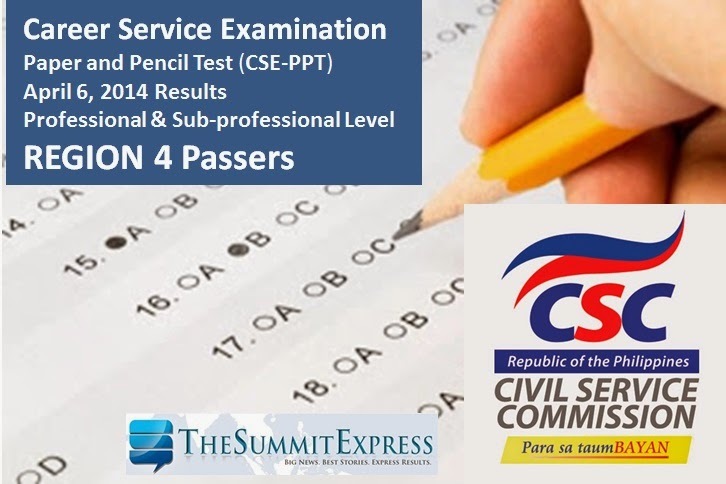 Manila, Philippines - The Civil Service Commission(CSC) has finally announced the full results of April 6, 2014 Civil Service Exam- Paper and Pencil Test (CSE-PPT) also known as Career service examination on Monday, May 19, 2014. The complete list of passers for Professional and Sub-professional level for Region 4 (CALABARZON and MIMAROPA) are available on this page. 782 04 002625 DAÑEZ, HECTOR S.
2623 04 002865 TRISTE, DIANNE ROSE N.